The domestic canary is a small songbird. Breeders divide canaries into three main groups: colorbred canaries, song canaries and type canaries. Black canaries and red canaries are examples of the colorbred variant, which are bred for their plumage. Song canaries are bred solely for their chirps and songs, while type variants are bred for their body shapes and physical characteristics, including both size and conformation. Canary birds originated in the Canary Islands, the Azores and Madeira, and belong to the finch family. They were first domesticated by Spanish sailors, who brought the birds to mainland Europe in the 17th century. The first canary breeders were monks, who would sell only male birds and keep the females for themselves. Thus, the canary was, historically, a prized and expensive pet. Size: Canaries are small, with most birds reaching a size of no more than 6 to 8 inches or so in adulthood. Plumage: While the canary is usually pictured as yellow or green, colorbred canaries have been engineered in a selection of other colors. Red canaries are popular, and the black canary is a designer bird created by concerted breeding efforts. Other color variants include rose, white, brown and bronze. Plumage is invariably of a single, consistent color. Song/Chirp: As a songbird, the canary exhibits an intricate, pleasant and cheerful song that uses whistling and chirps to produce an impressive range of notes. They learn to sing from other canaries, so birds kept in pairs or families tend to be the most expressive. Canary birds don’t like being directly handled by humans and tend to be territorial, so if you keep multiple canaries, it’s best to cage each separately. Because they’re flighty by nature, be sure there’s no more than half an inch of space between cage bars. Otherwise, your bird may well wriggle through and fly away. Feeding: Canaries need a high-protein, specially engineered bird feed. The chopped-up shell of a hard-boiled egg makes an excellent dietary supplement. At its most basic, a healthy canary diet should consist of a mixture of specially formulated canary seed and rapeseed, in proportions of about 70 percent canary seed and 30 percent rapeseed. Mix any vitamin supplements directly into your pet’s water supply, according to package directions. Grooming: As with all birds, grooming is usually simple and taken care of by the bird itself. Give your pet a clean bath to wash in, and watch its nails. They’ll need to be trimmed now and then when they get too long. 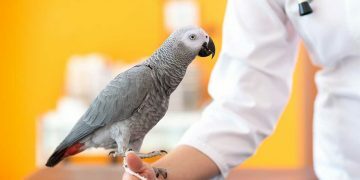 Health Concerns: Never use cat litter to line a canary’s cage to keep it clean – the bird will eat the substance and die. If yours is an outdoor canary (that is, kept in an aviary outdoors), collect its droppings annually so a vet can analyze them for signs of worm infection and other bird health problems. Mosquito bites can be deadly to canaries as well, so make sure your windows are securely screened. 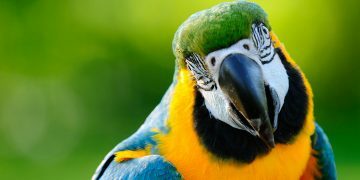 If your bird develops facial lesions after possible contact with a mosquito, take it to the vet immediately. Life expectancy: Healthy domesticated canaries usually live for about 15 years. 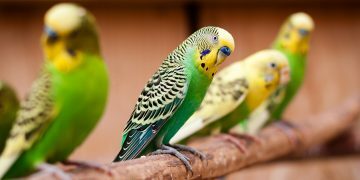 When browsing the various canaries for sale at a pet store, take some time to listen to each individual bird’s song before purchasing it. Songs are variable from animal to animal, with some canary birds displaying more musical aplomb than others. Prices range considerably. Some canaries cost only a few dollars, while specially bred birds can cost as much as $350. Canary cages run anywhere from $50 to $100 or so, and it’s a good idea not to skimp on this expense. A sturdy, well-built and spacious bird cage will provide your pet with a good home and may even extend its life.